The Ashanti regional constituency chairmen of the main opposition New Patriotic Party (NPP) are calling on the Council of Elders of the party to immediately consider a withdrawal of their statement asking the National chairman of the party to be suspended. According to the chairmen, such moves upset the flagbearer’s call for peace and tranquility in the Danquah-Busia-Dombo tradition. In a statement Monday, the group appealed to all party members to strictly abide by the peace campaign being championed by Nana Akufo-Addo in order for the party to win victory in the 2016 elections. They also asking that the chairman, Paul Afoko, is allowed the space to use his own initiative to resolve the crisis that has befallen the party. The Ashanti Region Constituency Chairmen Association of the NPP has noted with grave concern the recent happenings in the party which has the potential to derail our collective efforts at winning the 2016 general elections. The Association is disappointed that despite the continuous public appeal by the flagbearer to party members to refrain from taking internal party issues to the media, certain senior party figures have openly disrespected the flagbearer’s calls. The most recent of the flagbearer’s calls were made at Oda and Tamale in the Eastern and Northern regions respectively when his “Rise & Build” tours got to those regions. 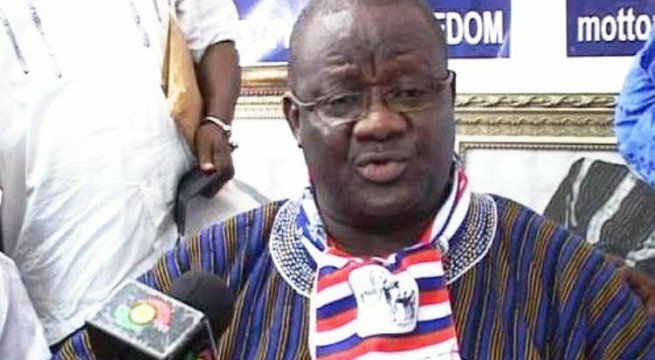 We want to emphasise that despite Nana Addo Dankwa Akufo-Addo’s attempt at trying to restore peace and harmony in the party, the National Council of Elders have petitioned the national disciplinary committee of the party to, among other issues, suspend the National Chairman of our party from his office till after the 2016 general elections. This is very dangerous! Regrettably, the Council has also released a statement into the media in flagrant disregard of the flagbearer’s directive. 1. All party members, especially national officers, should heed the flagbearer’s call to ceasefire and not to take internal party matters to the media. 2. The National Council of Elders should consider the immediate withdrawal of the petition it has sent to the Disciplinary Committee and rather allow the flagbearer to use his own initiative to resolve the issues at stake as quickly as possible. 3. All members of the party must, as a matter of duty, respect the hierarchy of the party at all levels. 4. The 5-member NEC Sub-Committee investigating the alleged financial malfeasance involving national Officers of the party should expeditiously deal with the issue and bring out its findings. 5. All committees and structures of the party must wake up and be alive to their responsibilities to enable the party kick-start the national campaign after the flagbearer’s “Rise & Build” tour. 6. The general membership of the party should bear with the national leadership at this time and remain focused in the hope that the necessary mechanisms are being put in place to ensure that the party emerges victorious in next year’s general elections. The Association is appealing to the flagbearer to take the necessary steps to bring peace and harmony into the party because we trust that he has the capacity and the clout to do it.